Don't let the weather ruin your vacation. Stop by the indoor pool and go for a refreshing swim. Enjoy lunch and a cocktail at the seasonal Mexican restaurant. Watch the sunset from your private balcony. 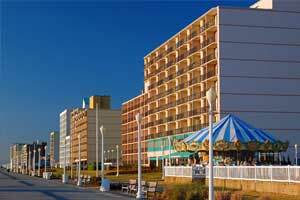 Anchored by a buzzing boardwalk, Virginia Beach boasts a slew of cultural offerings, including a contemporary art museum, aquarium, and unique historic sites.